The males and females listed below have all been a critical part of our breeding program. We are grateful to have had such outstanding dogs here to produce such wonderful progeny. Razzy is now retired from our breeding program. Dam to our beautiful stud males, Peter and Buzz. She has some of the most outstanding progeny out there. THANK YOU Razzy for being such an awesome dog, mother and friend. You started it all here and we couldn't be more proud. Razzy is spayed, retired here at Vom Gildaf and will spend her retirement years racing Flyball for more titles. Razzy is a bi-color female. Edge is now retired from our breeding program. Being a breeding female was not meant to be for her and so we didn't risk her getting infections or other issues, we retired her. She is spayed and will live out her years here with her family at Vom Gildaf. We adore this girl and are so grateful to have had 2 beautiful litters with her. Edge is a solid black female. Edge is a medium drive, high energy female. She has outstanding conformation and a very strong head. Her ball drive is through the roof! She is full of personality, a social butterfly yet naturally protective. She produces puppies with very strong work ethic, ball/toy drive and super good tracking/detection noses. ​Tramp is from our "T" litter. We are very excited to have this girl as part of our breeding program. We hope she carries on her mothers ability to produce excellent temperaments, type and structure. Shakira is a red sable female. Shakira is a high drive, high energy female out of our foundation female, Brazen. She has an outstanding tracking nose, conformation and is a very happy girl. Angel is now retired from our breeding program. She was one of our foundation females, our first German Import. She has had several wonderful litters for us producing some outstanding offspring. THANK YOU Angel for being such a great mom, friend and dog. Angel now lives in Madison with her new mom, Diane. She is the only dog, VERY happy and spoiled. She will live out her retirement years doing Therapy Dog Work and being Diane's best friend. Angel is a black sable female. Tinah is from our "T" litter. We are very excited to have this girl in our breeding program. Tequila is an outstanding dog. She has matured in to a beautiful female. We are excited to pair her with our males. Brenda has a wonderful home IL and will also have a get away cabin in the hills of Tennessee. We are so happy that she is going to such a fantastic retirement home where she can run, be happy and very spoiled. Congratulations Fred and Maria. Brenda is a very high drive, high energy female. 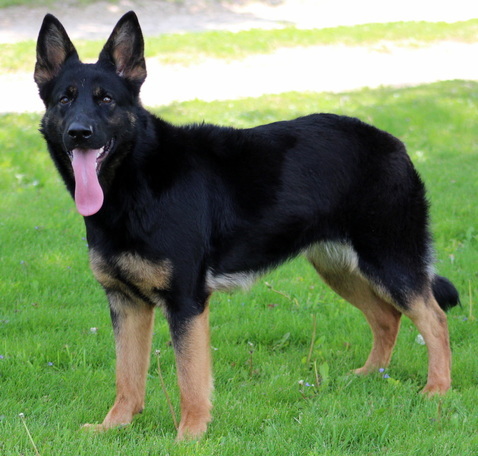 She produces excellent working dogs and has several progeny in Schutzhund, SAR and other dogs sports. She has insane ball/toy drive and her hunt drive is endless. G Bianca Orrylordblack ZVV1 5CX1/p "Annie"
Annie is retired from our breeding program. She has a wonderful family home waiting to adopt her. She is spayed and will live with one of her sons from her "J" Litter and bask in a life of being spoiled. So happy for Annie. Congrats Pat and Sue. Thank you Annie for the wonderful puppies you produced for us at vom Gildaf. You are a very special girl to us. 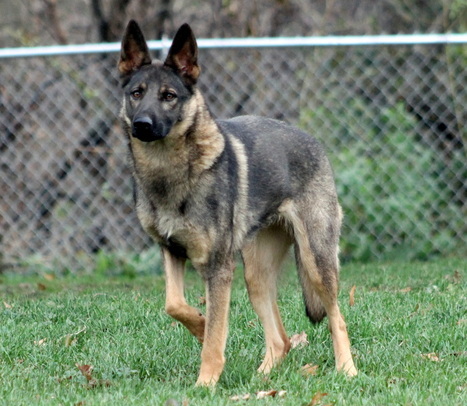 Annie is a medium drive, medium energy female. She has excellent ball/toy and food drive. She produces very nice working dogs for SAR, Sport and also produces great family companions. Annie has a very sweet demeanor but will light up if given a reason to do so. 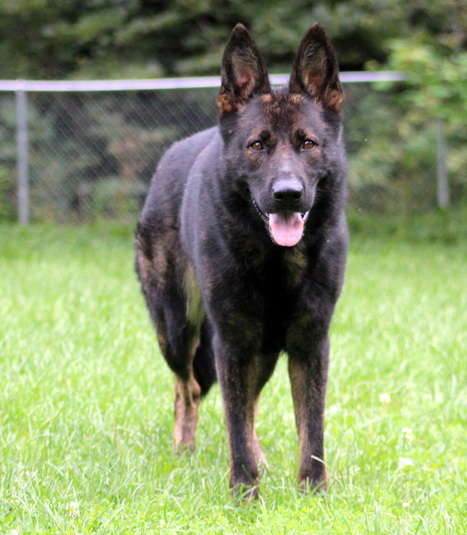 Nikita will be back at Schraderhaus K9 in Washington to be utilized in Jean's program. Thank you for two beautiful litters Nikita. We will miss you. Nikki is a black sable female. Mako vom Kistha Haus "Mako"
Mako is a solid black female. Amy is a solid black female.